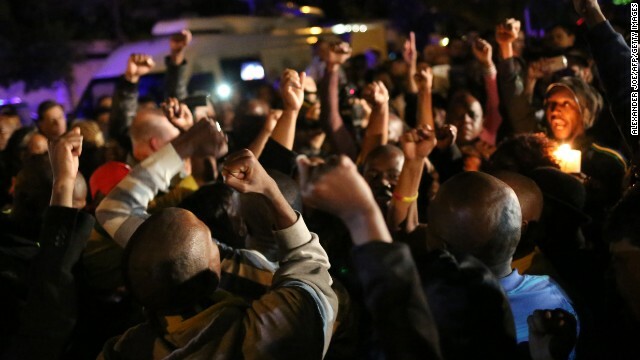 Mourners sing outside the home of former South African President Nelson Mandela in Johannesburg on Monday, December 9. 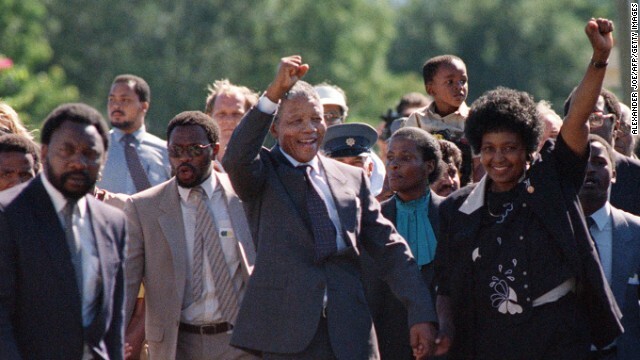 The revered statesman, who emerged from prison to lead South Africa out of apartheid, died on Thursday, December 5. 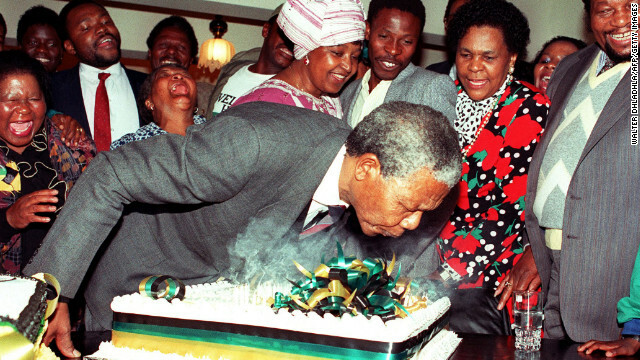 Mandela was 95. 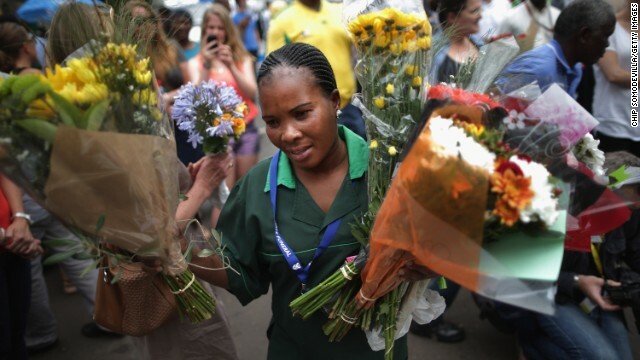 A groundskeeper collects flowers left by visitors at Mandela's home in Johannesburg on December 9. 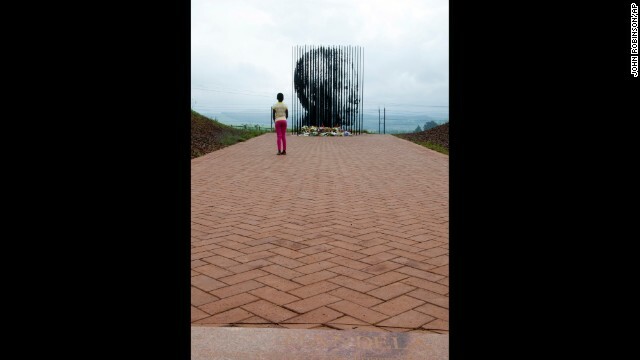 A child checks out at a sculpture of Mandela by Marco Cianfanelli near Howick, South Africa, on December 9. 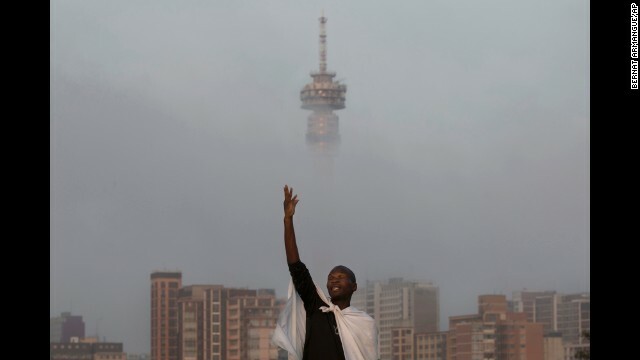 A mourner prays on a hill overlooking Johannesburg on Sunday, December 8. 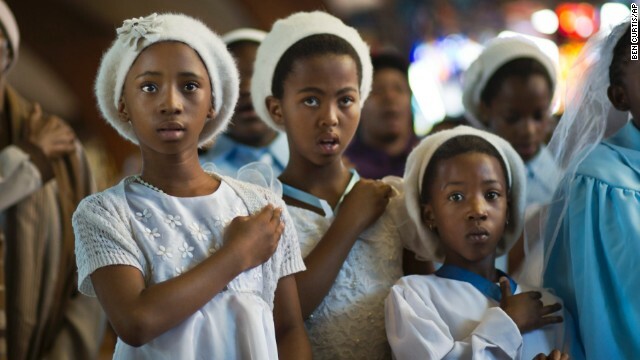 Young choir members attend a morning Mass on December 8 in memory of Mandela at the Regina Mundi Catholic Church, one of the focal points of the anti-apartheid struggle, in the Soweto district of Johannesburg. 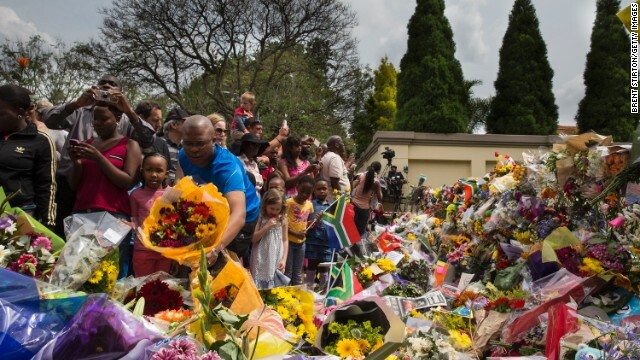 South Africans flocked to houses of worship for a national day of prayer and reflection to honor Mandela. 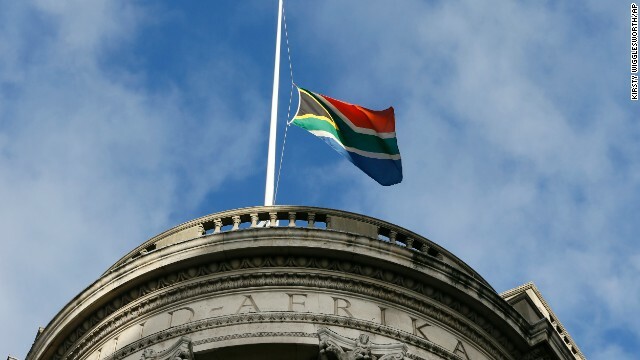 A South African flag flies at half-staff to honor Mandela on December 8 at the South African High Commission in London's Trafalgar Square. 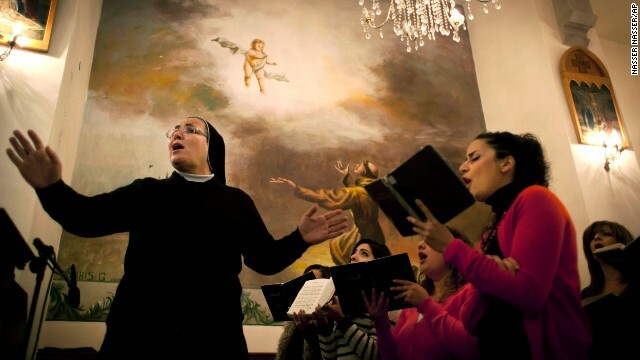 A choir sings hymns during a special service in the honor of Mandela on December 8 at the Holy Family Church in the West Bank city of Ramallah. 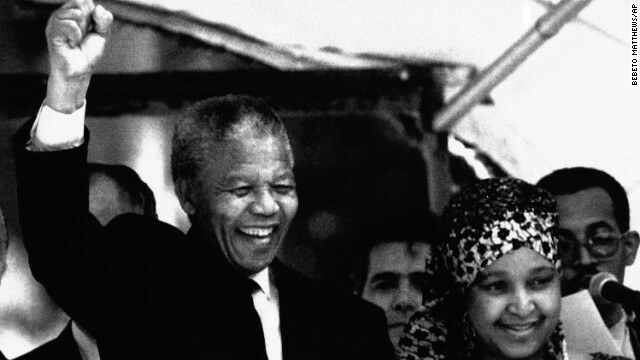 Palestinians mourned Mandela as a loyal champion of their cause. 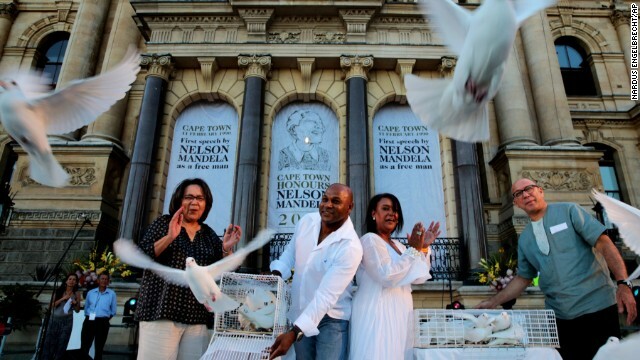 Doves are released for Mandela at the Grand Parade in Cape Town, South Africa, on December 8. 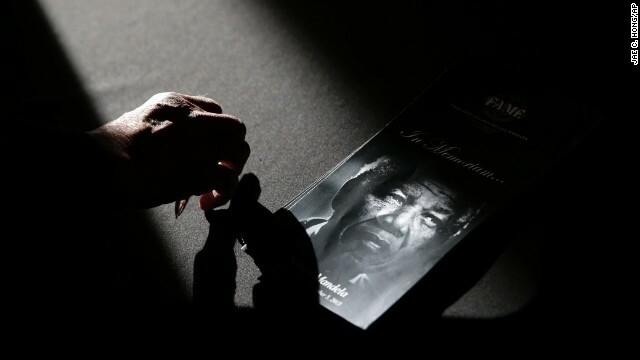 A program is illuminated by the morning sunlight during a service held to honor Mandela on December 8 at First African Methodist Episcopal Church in Los Angeles. Areva Martin sings during the service at First A.M.E. Church on December 8. 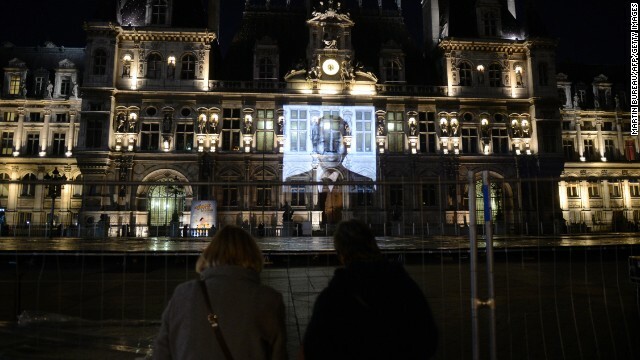 A portrait of Mandela is projected onto city hall in Paris on December 8. 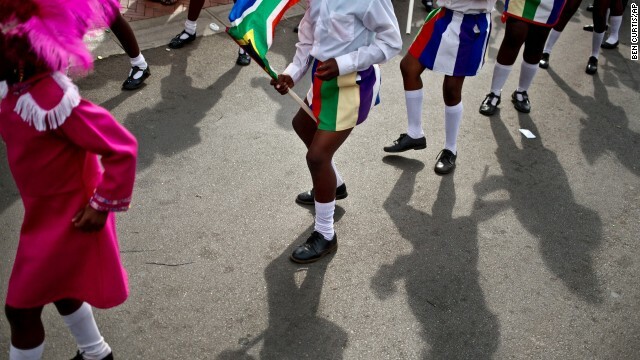 Children in a drum majors group perform a dance outside Mandela's old house on Saturday, December 7. Mourners gather in front of the South African embassy in Tehran, Iran, to pay their respects on December 7. 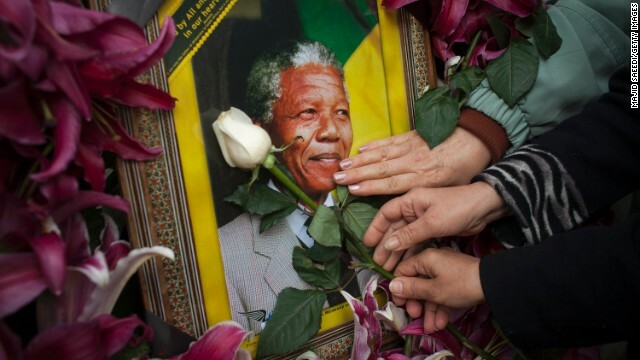 Crowds of people pay tribute to Mandela outside his Johannesburg home on December 7. 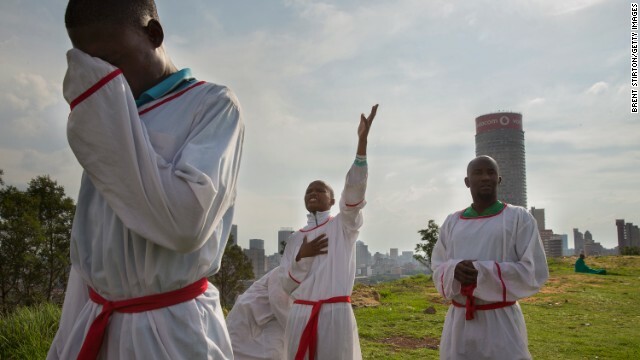 Christians mourning the loss of Mandela say prayers on a hilltop overlooking Johannesburg on December 7. 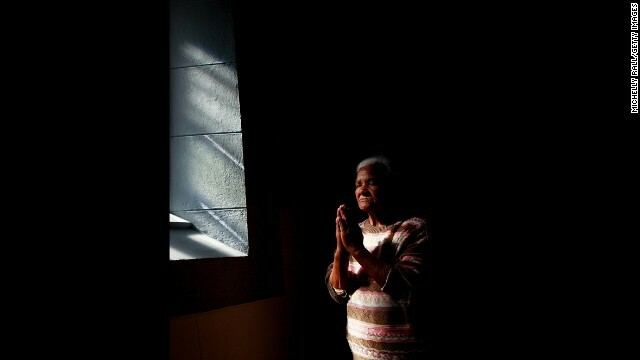 A woman prays at the Central Methodist Church as people remember Mandela on Friday, December 6, in Cape Town, South Africa. 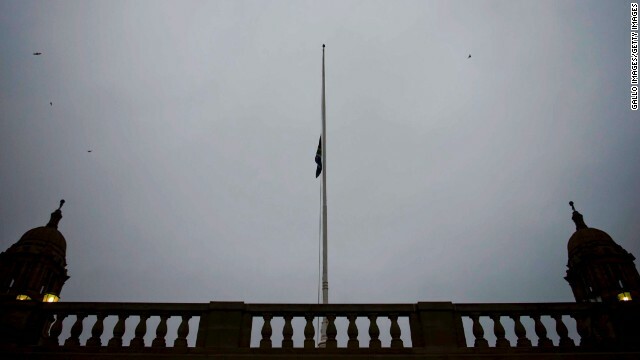 The South African flag is flown at half-staff at the Union Buildings on December 6 in Pretoria, South Africa. 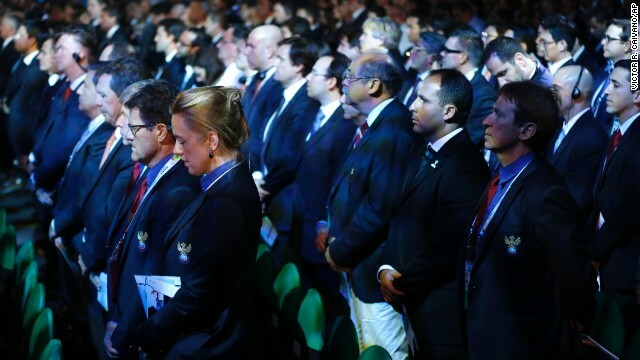 Delegates from countries all over the world stand for a moment of silence for Mandela on December 6 during the drawing ceremony for the 2014 World Cup in Costa do Sauipe, Brazil. 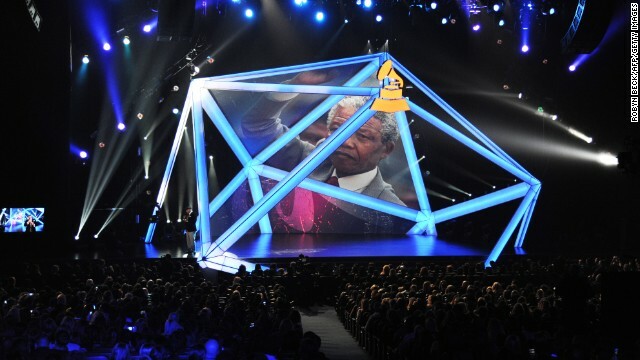 Mandela is honored at the the Grammy Nominations concert at the Nokia Theatre in Los Angeles on December 6. 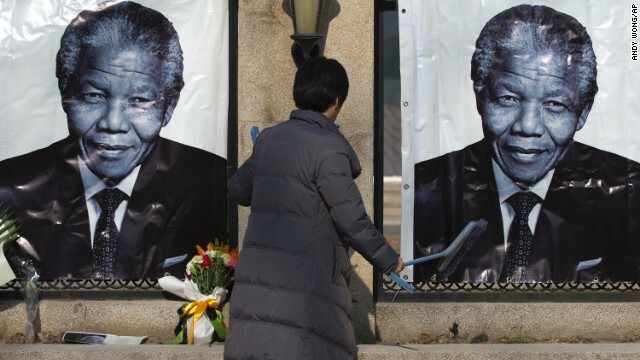 A woman cleans up outside the South African Embassy in Beijing where portraits of Mandela and flowers offered by people are placed on December 6. 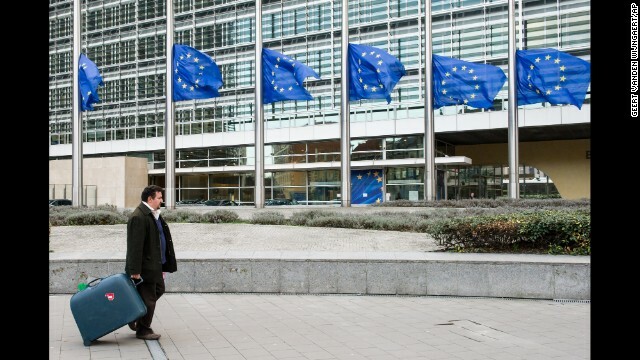 European Union flags fly at half-staff at the European Commission headquarters in Brussels, Belgium, on December 6. 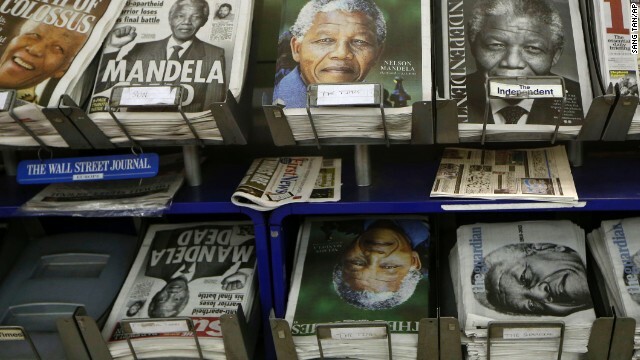 Newspapers with Mandela on the front page are on sale in London on December 6. 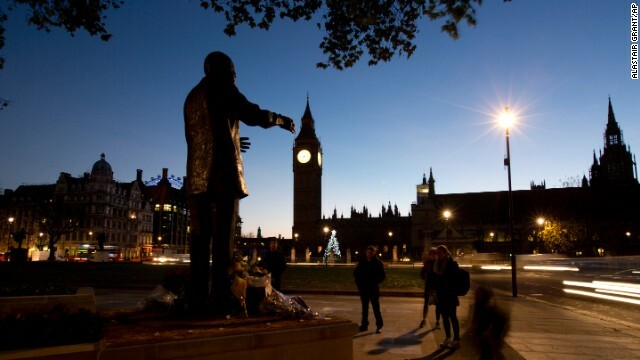 Early morning commuters stand in silence beside a statue of Mandela on December 6 in Parliament Square in London. 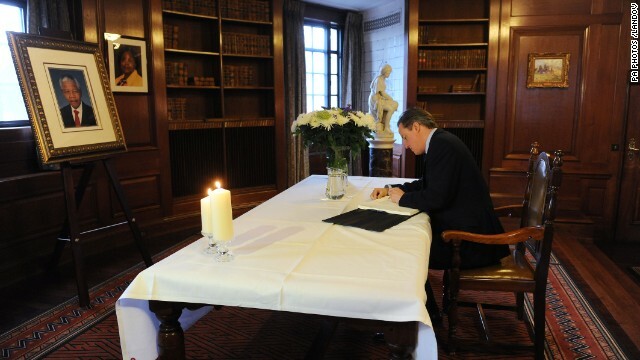 British Prime Minister David Cameron signs the book of condolence at the South African Embassy in central London following the announcement of Mandela's death. 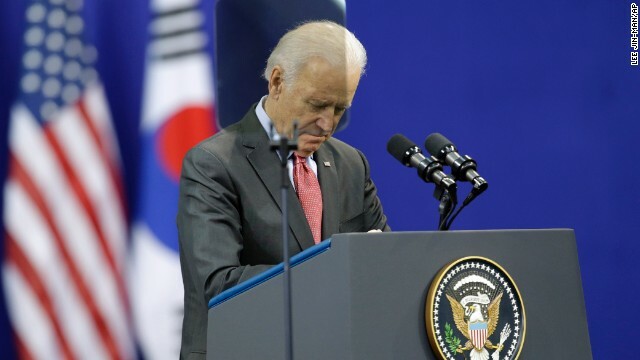 U.S. Vice President Joe Biden pays a silent tribute to Mandela before his speech on December 6 at Yonsei University in Seoul, South Korea. 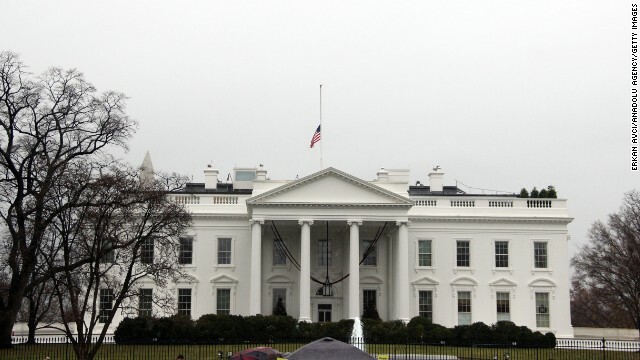 An American flag flies at half-staff above the White House in Washington on December 6. 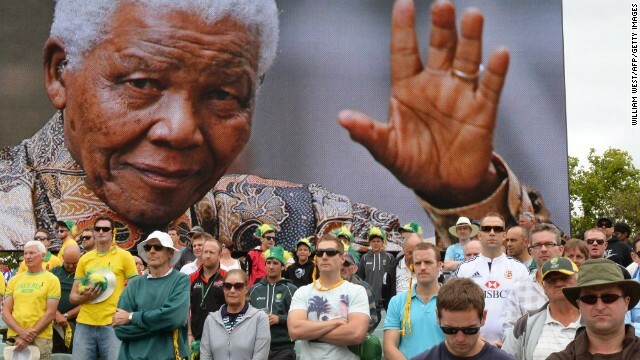 Australian and English cricket fans in Adelaide, Australia, observe a minute of silence December 6, to mark the passing of Nelson Mandela. A woman cries outside Mandela's house in Johannesburg after Mandela's death on Thursday, December 5. 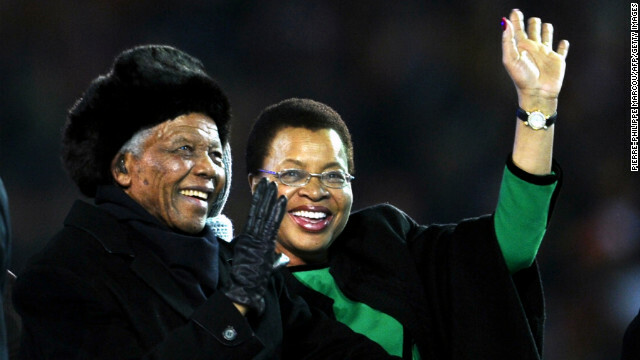 South Africans sing as they pay tribute to Mandela in Johannesburg on December 5. U.S. President Barack Obama pauses as he speaks about Mandela in the briefing room of the White House on Thursday, December 5. 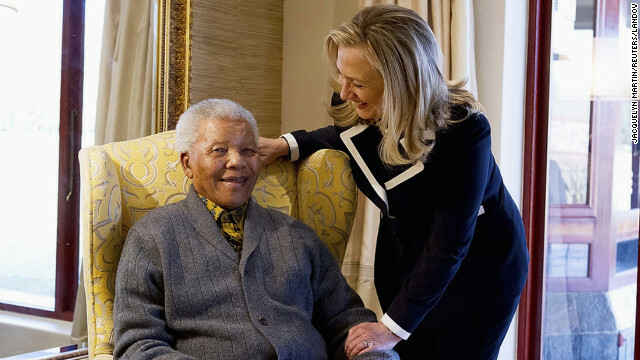 Obama said he was one of the "countless millions" who drew inspirations from Mandela's life. 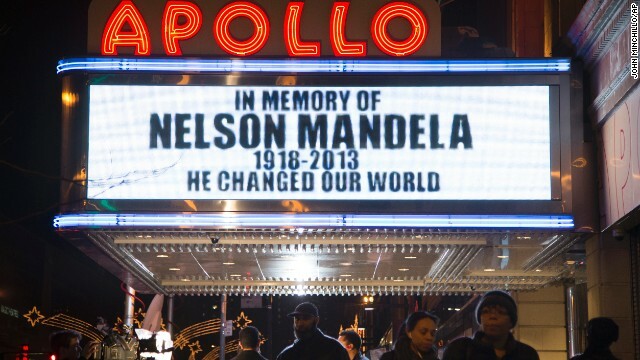 The marquee at New York's Apollo Theater honors Mandela on December 5. An artist who goes by the name Franco the Great stands beneath a Mandela mural that he painted in New York's Harlem neighborhood more than 15 years ago. He later added Obama to the mural. 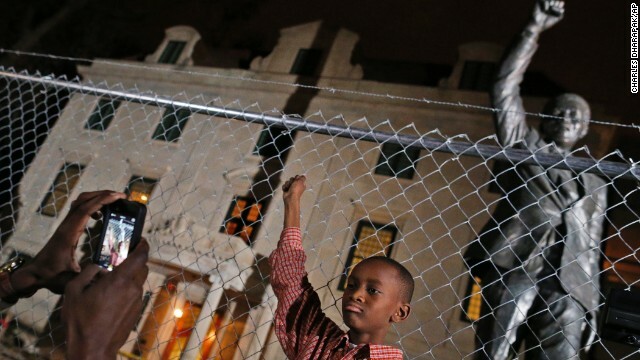 Keaton Anderson, 10, poses for a photograph while he and his father visit Mandela's statue at the South African Embassy in Washington on December 5. The statue is under renovation. 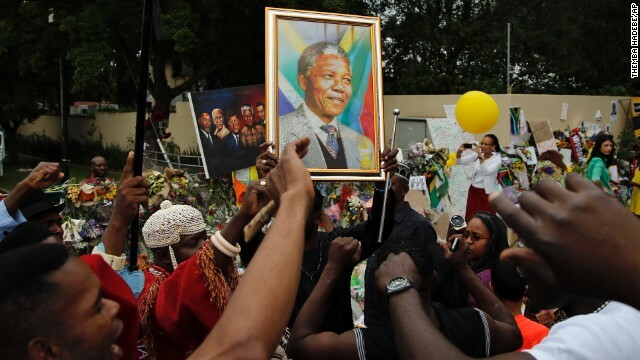 South Africans pay tribute to Mandela in Johannesburg following his death December 5. 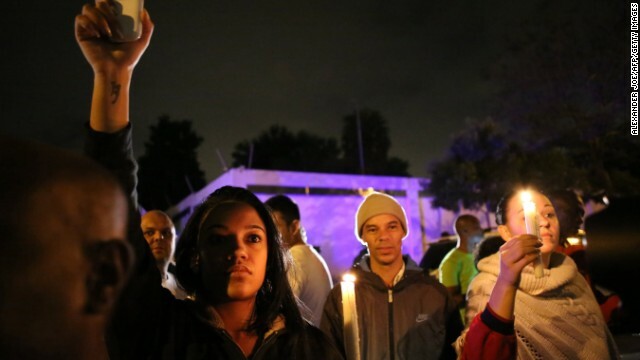 A candlelight vigil is held December 5 outside Mandela's Johannesburg home. "It's sad, but what can we do?" one resident asks. "Let him rest in peace." 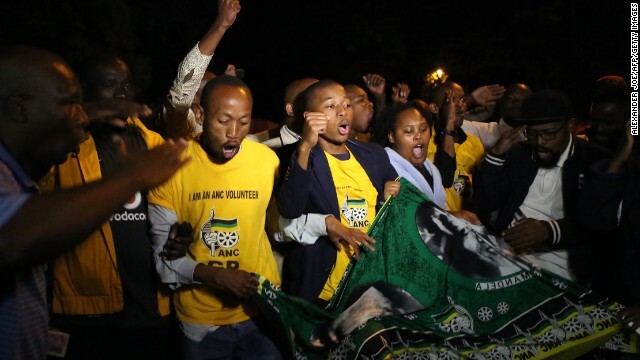 Johannesburg, South Africa (CNN) -- South Africans mourned the death of their first black president, weeping, singing and gathering near Nelson Mandela's homes and other landmarks linked to him nationwide. 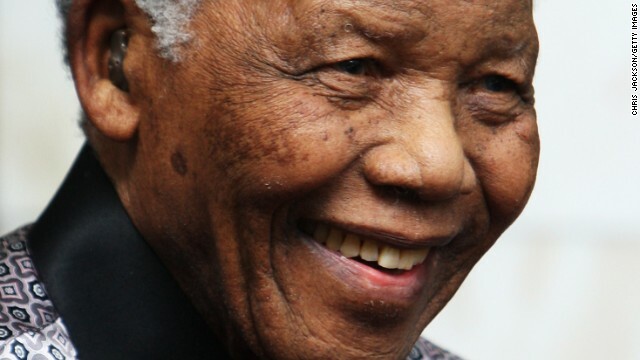 Mandela, 95, died Thursday in Johannesburg. 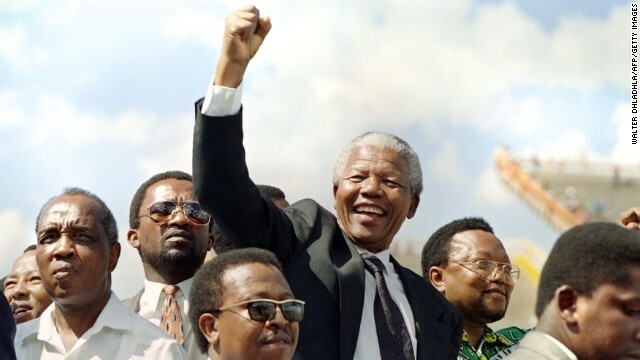 "We will always love Madiba for teaching us that it is possible to overcome hatred and anger in order to build a new nation and a new society," President Jacob Zuma said Friday, referring to the revered statesman by his clan name. In Soweto township, where Mandela lived before he was imprisoned for 27 years, giant posters of his face adorned streets. Residents surrounded his former red brick house on a busy street and sang songs of freedom. On the grass near Mandela's home in the Johannesburg suburb of Houghton, children spelled out with rocks "We love you Mandela." 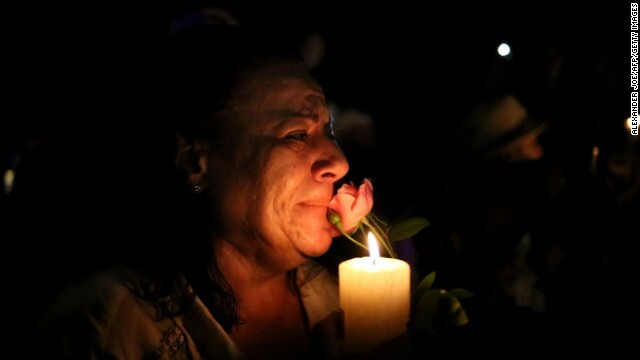 Others wept, lit candles and sang in celebration of a life well lived. 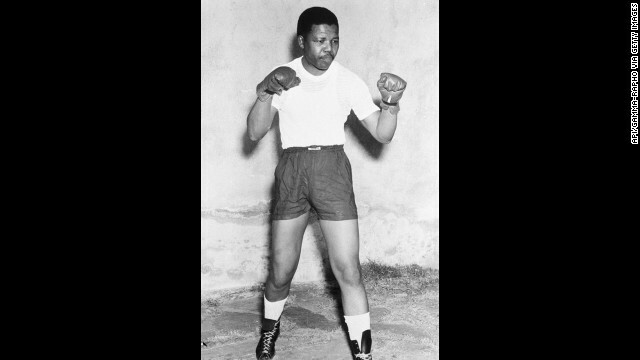 A state funeral will be held December 15 in his ancestral hometown of Qunu in the Eastern Cape province. 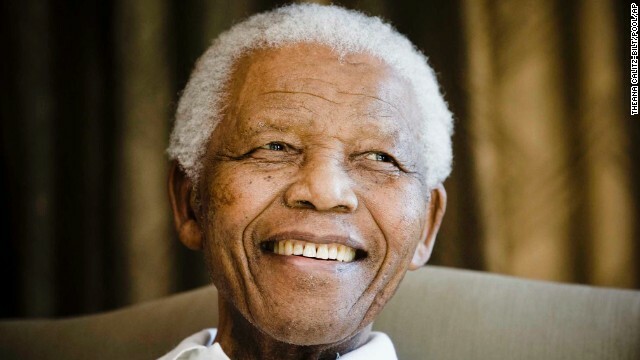 Before the funeral, various events to honor him are planned in major cities. Sunday will be a national day of prayer and reflection, and people will gather in places of worship to pray and meditate, Zuma said. 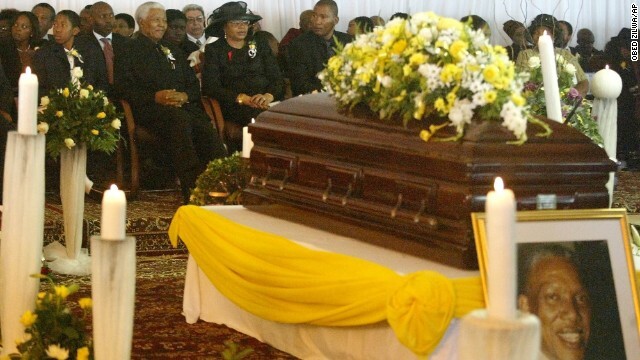 And his body will lie in state at the seat of government in Pretoria from Wednesday through next Friday. 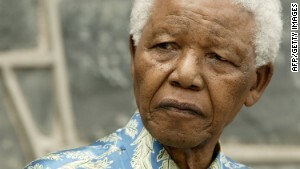 Zuma announced the death late Thursday in a nationally televised address. 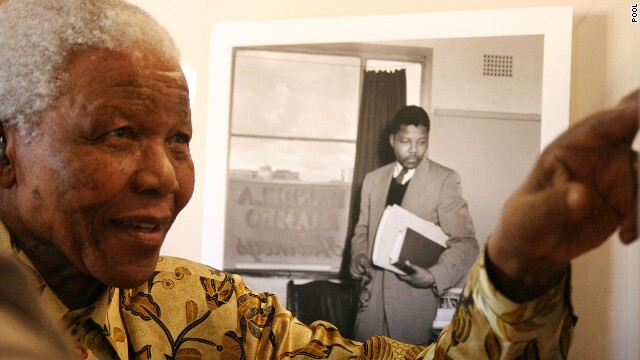 "Our nation has lost its greatest son, our people have lost a father," he said. 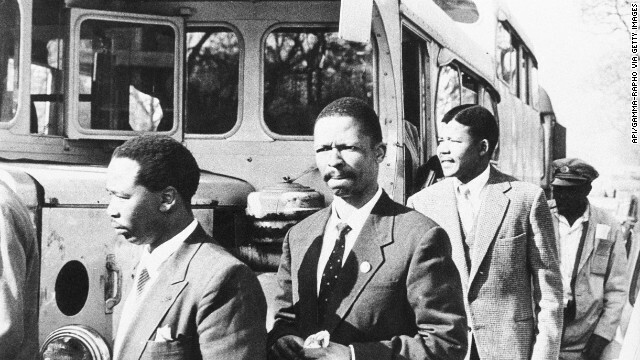 "Although we knew that this day would come, nothing can diminish our sense of a profound and enduring loss." 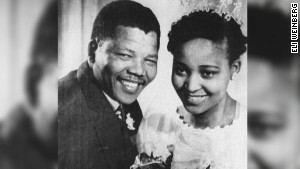 In recent years, Mandela had battled health issues that included multiple hospitalizations for treatment of a recurring lung infection. 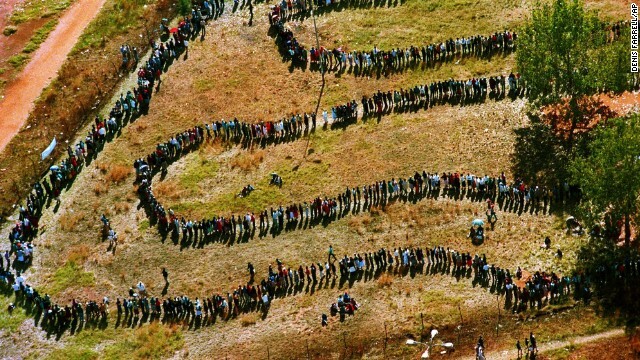 Many South Africans didn't get the news until Friday morning. "I woke up and was shocked when I saw it on television," said Wilson Mudau, a cabdriver in Johannesburg. "It's sad, but what can we do? Let him rest in peace. 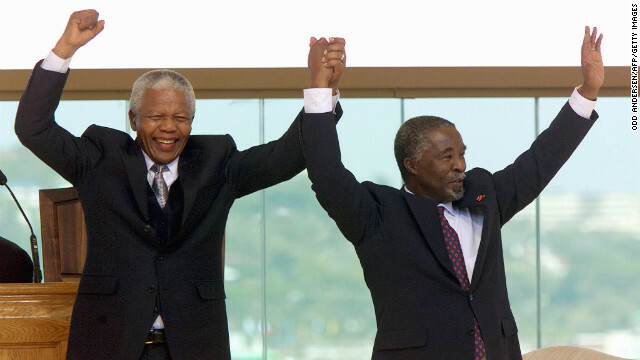 It's time ... Madiba has worked so hard to unite us." 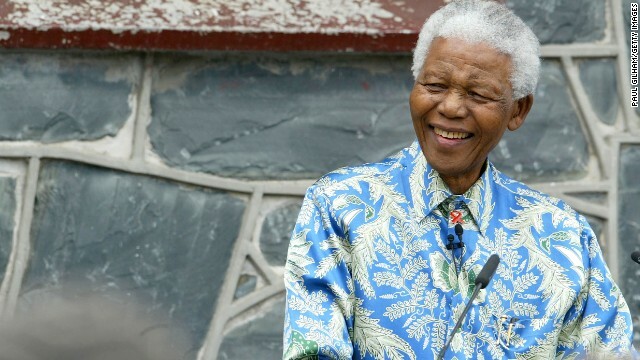 Nearly 8,000 miles north of Johannesburg, in Paris, leaders from 53 African countries attending a summit on peace and security observed a minute of silence for him Friday. 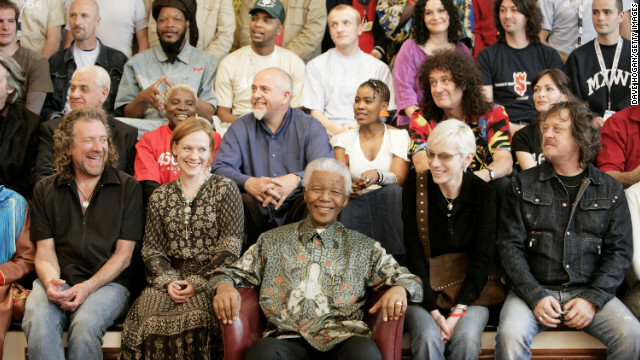 "I admired Mandela (because) he had not poisoned his heart," said Leo Udtohan of Bohol, Philippines. "He learned to forgive despite the horror he experienced while in prison." 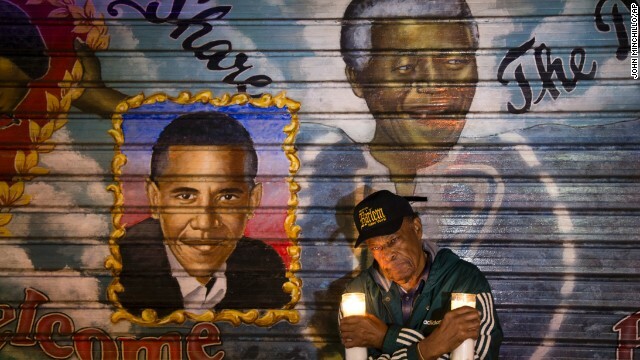 At New York City's Apollo Theater in Harlem, which Mandela visited in 1990, the marquee lit up in tribute. 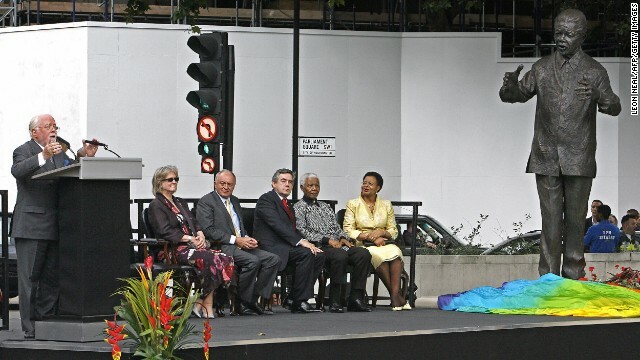 "In memory of Nelson Mandela, 1918-2013," it said. "He changed our world." 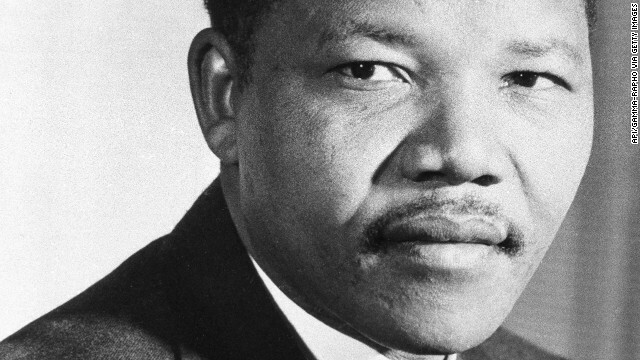 Mandela helped South Africa break the practice of racial segregation and do away with white minority rule. 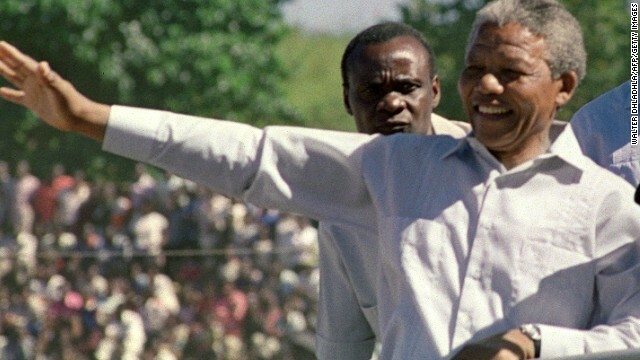 Imprisoned for nearly three decades for his fight against state-sanctioned racial segregation, he was freed in 1990 and quickly set about working to unite the nation through forgiveness and reconciliation. 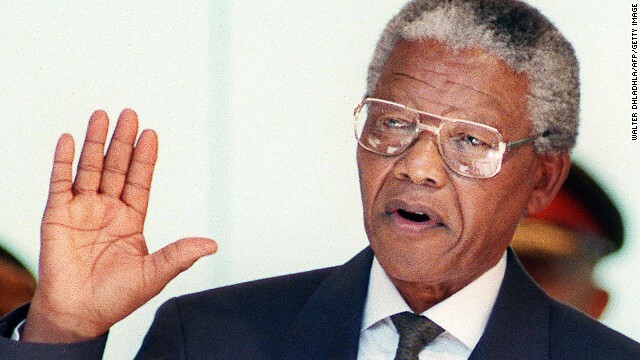 "As I walked out the door toward the gate that would lead to my freedom, I knew if I didn't leave my bitterness and hatred behind, I'd still be in prison," Mandela said. 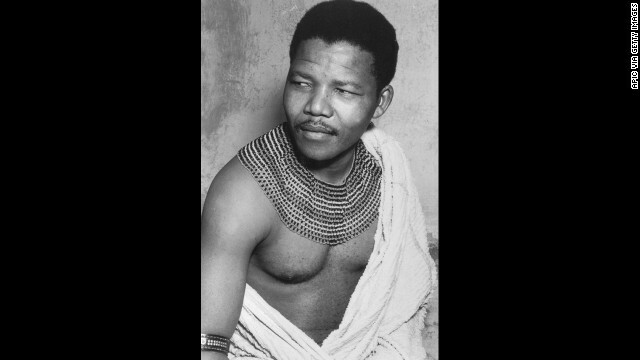 His rejection of vengeance led him to assume roles that led from freedom fighter to prisoner to a world symbol of the struggle against racial oppression. And, four years after he left prison, he became the nation's first black president, cementing his place in the consciousness of the nation and the world. 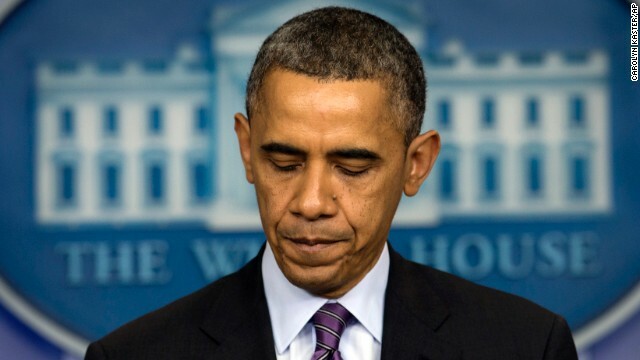 "I'm just glad he finally found his place of rest," said Omekongo Dibinga of Washington. "From the family drama to his health problems, it just seemed like he could never get a break in his later years. Now I hope be can finally rest, but he'll probably still be watching down on us in frustration." 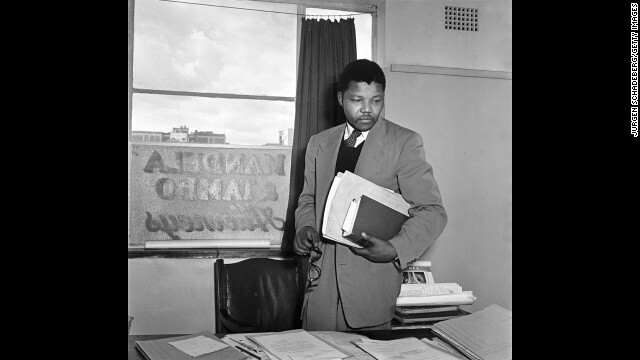 His recent bouts of illness had prepared many South Africans for Thursday's announcement. 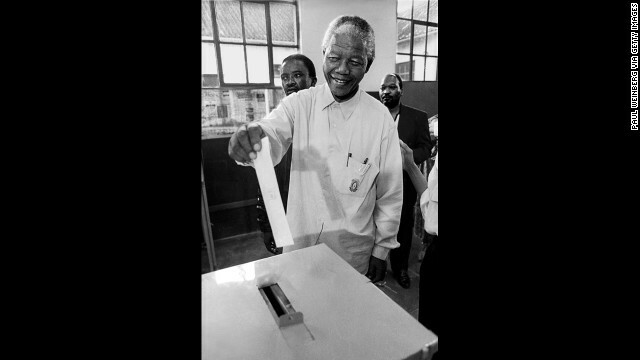 "We all knew he'd leave us at some point," said Tony Karuiru, a Johannesburg resident. 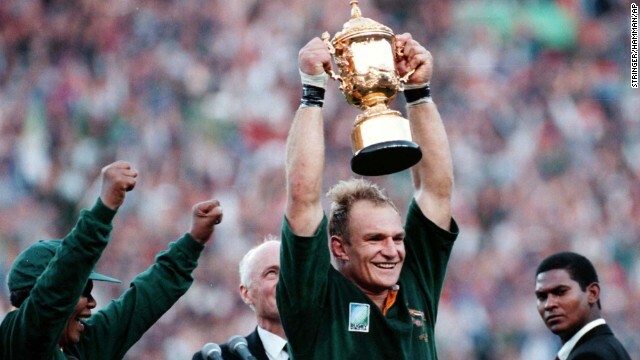 "But we were hoping that he would be with us during the festive season. It's the holidays, I just wish God would have given him a few more days with us as well." 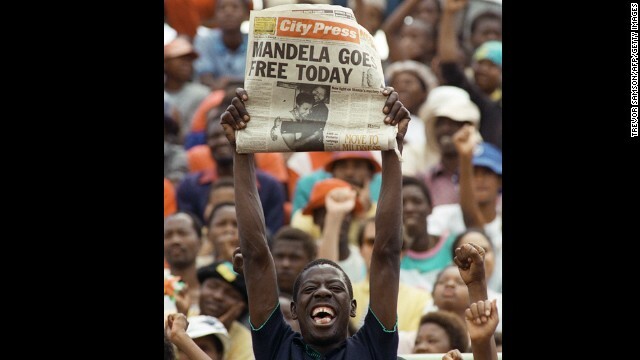 Thomas Rabodiba said though he expected Mandela's death, he was having a hard time accepting it. "At first, when I heard he died, I thought it was the usual rumors we get all the time," he said. "After I heard the president's announcement later that the old man has departed, then I believed that he's really gone." 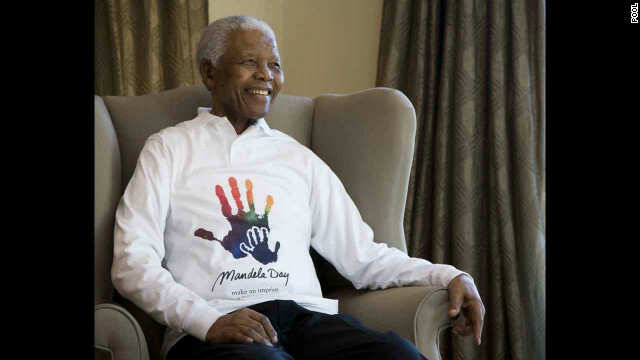 Mandela will be remembered for many things, but his message of forgiveness and reconciliation may resonate the most. 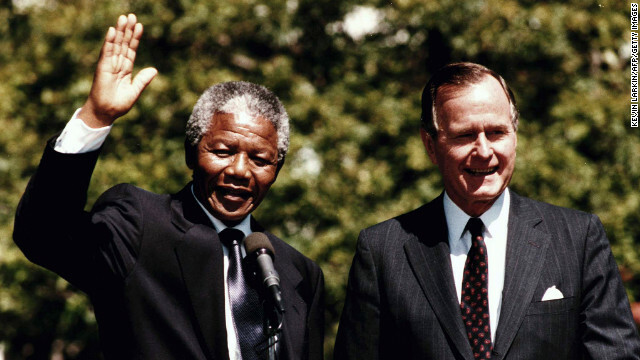 "Mandela's biggest legacy ... was his remarkable lack of bitterness and the way he did not only talk about reconciliation, but he made reconciliation happen in South Africa," said F.W. 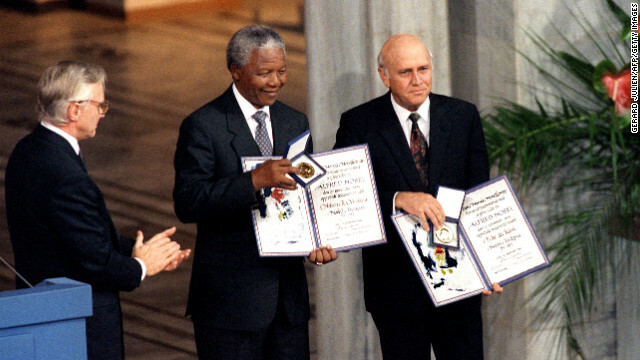 de Klerk, South Africa's last white president and Mandela's predecessor. 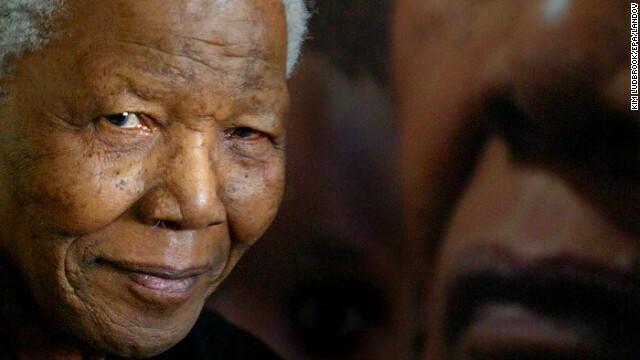 Zuma has ordered flags around South Africa to be flown at half-staff until the funeral. The U.S. government and Buckingham Palace also lowered their flags. 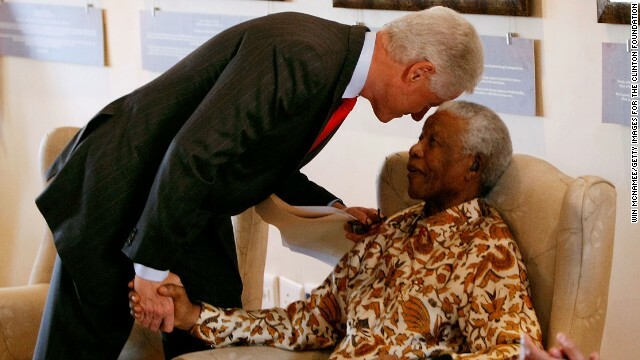 "Nelson Mandela achieved more than could be expected of any man," President Barack Obama said Thursday. "We have lost one of the most influential, courageous, and profoundly good human beings that any of us will share time with on this Earth. He no longer belongs to us -- he belongs to the ages." In recent years, plans for a fitting farewell were hammered out among the government, the military and his family. Events over the next 10 days will culminate in a state funeral to be broadcast worldwide and a private farewell for those closest to him. 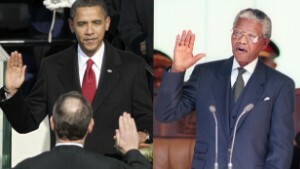 CNN's Arwa Damon reported from South Africa, and Faith Karimi and Tom Watkins reported and wrote from Atlanta.